If you have a Facebook account then likely you have visited a website and found it already knew something about you. Perhaps you saw a section showing pictures of other people who ‘like’ that page and some were your friends. Maybe it knew your location. How did the site know that? You never even signed in! You may be giving away more public information than you think. Or your friends may be doing it for you with your permission. Let’s investigate. First, you need to know that every Facebook account has 3 pieces of public information: Your name, your profile picture and your Facebook UserID. Your UserID is not publicly tied to your email address or phone number but public sites can access this ID against your picture and name. Let’s say that John Doe and Jane Doe are on Facebook and Jane has user ID 100. John logs in to Travelocity using his Facebook account. Travelocity now has access to John’s friend list including the fact that he is friends with User 100. The site records John’s name linked to User 100. Later Jill visits the page. Though she has not logged in, her browser knows she is user 100 so it presents her a list of people who like Travelocity and includes John’s picture in that list. App Settings – I agreed to what?? 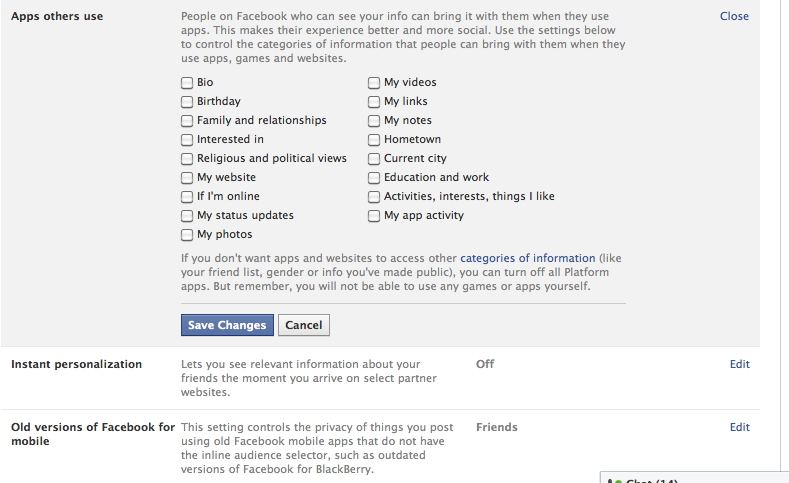 The Apps Settings page in Facebook allows you to control how external Apps interact with your data. It also USED TO control how external sites use your data when your friends log in. This is key so I will repeat it, even if you have never visited the site, these settings also used to indicate what a site can take from your profile via your friend who has signed in. Inside the App Settings, you will find an old setting called Apps Others Use. This is the area where you could have decided what information websites and apps can take from you through your friends. Facebook removed this section in 2018 after the Cambridge Analytica scandal. Since it used to be checked by default, most people were using it inadvertently which is why so much of your data has already been ‘leaked’. This is what it used to look like. Take a few minutes to review the remaining settings, most importantly the apps you are connected with (under Apps, Websites and Games) to ensure you know who has access to your data. 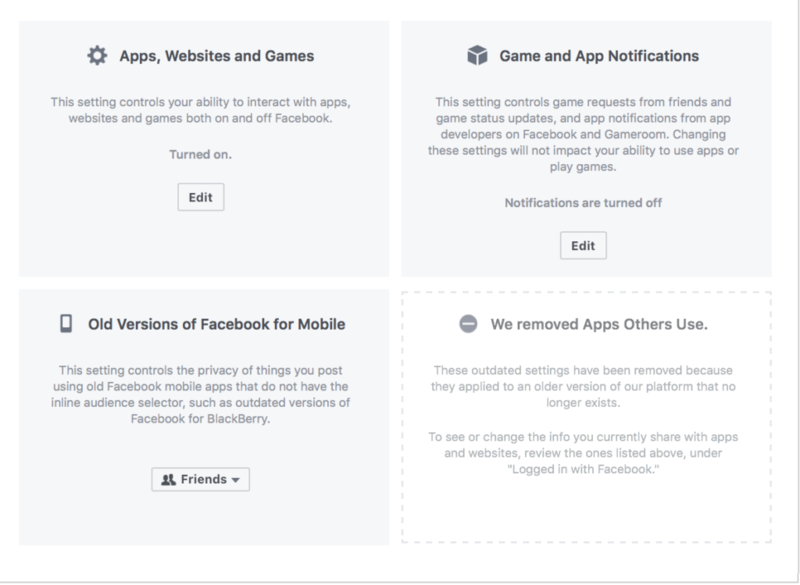 These are apps you either use your Facebook ID to sign in with or that you have clicked through while on Facebook. For each app, it will tell you who on Facebook can see that you use it (I recommend setting this to ‘Only Me’), and which of your information you are sharing. Limit all of the ‘Info you Provide to this App’ to the minimum. If you are still uncomfortable with the shared data or don’t use the app, remove it. In the simplest terms, networks use two main pieces of technology to track what you are doing online. Cookies: Files that contain information about you and your computer use. If you have logged into Facebook in the past on that computer and not subsequently logged out, that cookie (and your User ID) can be shared with any other site you have open. local storage: Data kept on your computer or device storage for caching (saved views of the websites) for faster loading or offline use. To improve your social experience, give you the information that is relevant to your friends and circles. 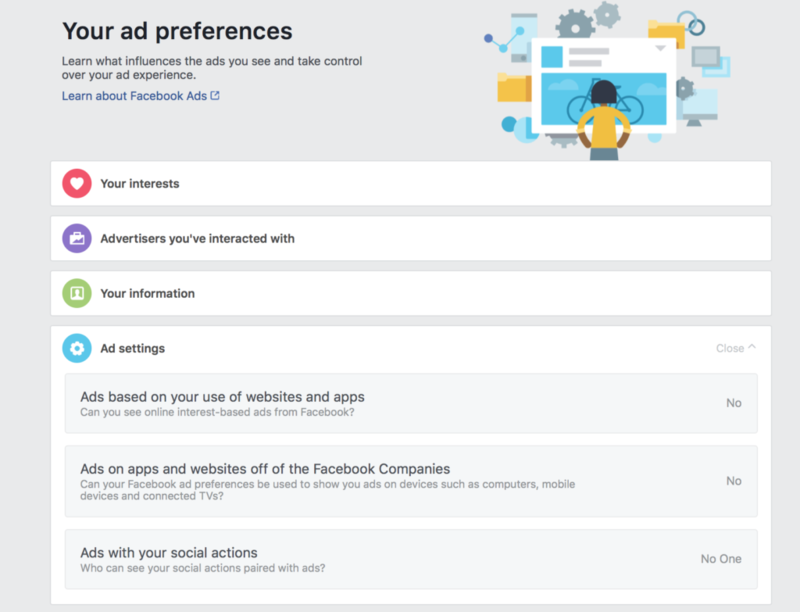 To help Facebook and corresponding companies offer you ads that matter most to you. These are valid and helpful. I have said before that if I search “winter tires” in Google I would much rather have local stores show up then a random listing. I appreciate ads for items I may actually buy rather than getting ads for diapers and kitty litter. And I would rather stay at a hotel that I know my friend went to and liked. That said, sometimes more information is passed around than I am comfortable with. I went through the cookie list for Facebook. It was typical of a public site – nothing more concerning. by default: location, gender, favourites (that are public), friends list, followers, relationship status, network and schools attended. When you provide information on the new site, it does not pass it back to Facebook. 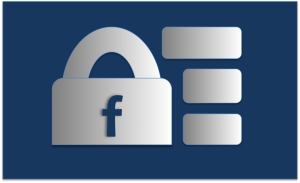 Also, any individuals you may have blocked within Facebook will remain blocked on your connected site. When you log into Facebook via these sites, look for www.facebook.com in the address bar to avoid phishing (sites that are looking for your login but are not legit). Only agree to the information and permissions that make sense to that app – some apps ask for far more than they need.